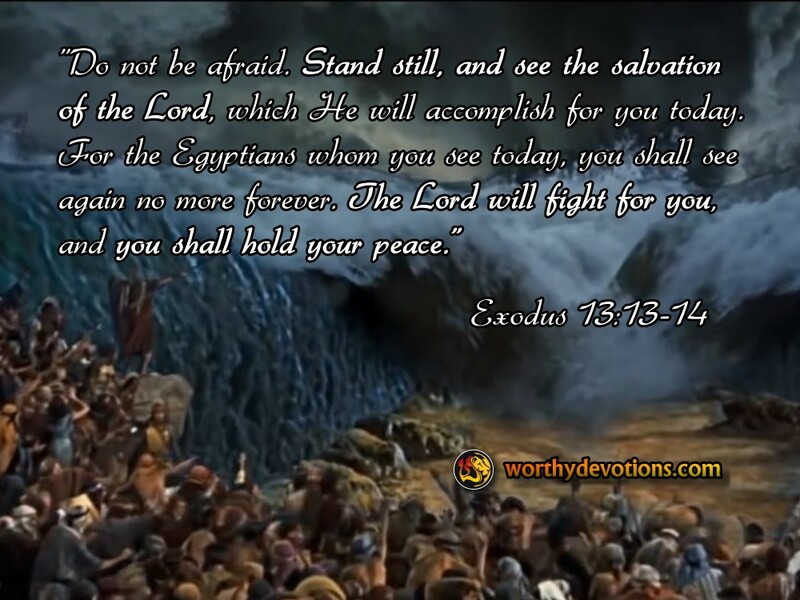 Exodus 14:12-14 Is this not the word that we told you in Egypt, saying, 'Let us alone that we may serve the Egyptians?' For it would have been better for us to serve the Egyptians than that we should die in the wilderness." And Moses said to the people, "Do not be afraid. Stand still, and see the salvation of the Lord, which He will accomplish for you today. For the Egyptians whom you see today, you shall see again no more forever. The Lord will fight for you, and you shall hold your peace." Panic has a way of spreading through a crowd, and as it did, the children of Israel bitterly complained to Moses against the Lord. Yet in that desperate moment, with His people full of terror and miserable unbelief, the Lord spoke through His servant Moses declaring His faithfulness and mighty power to save. Stand still! – and see the salvation of YHVH! Nothing to do but stand and be delivered by the mighty Hand...... But then, miraculously separated by fire from their enemies, the children of Israel also needed to walk, to walk by faith on a seabed with walls of water towering on both sides, trusting that the Red Sea would not come rushing down upon them! Truly they were in His hands – beholding once again, the miracles of the Lord! We are standing now on the cusp of eternity, and we too, like the Israelites, are facing our test. The world seems to be teetering on the edge of disaster; so much evil surrounding us, as we wonder how and when can we be delivered from this rising tide of demonic threats? Can we learn from Israel's moment of panic? Or will we succumb to the rampant fear all around us? Will we have the presence of mind, the discipline, and the faith to remember the miracles God has performed in the past? These words must speak to us: "Do not fear – stand still – and see the salvation of our God, for the Lord shall fight for us – and we shall be at peace!" Those words in our minds and hearts will inspire us to walk through this dangerous world with faith, marveling at His power to protect and bring us to safety.